Keith, we are so excited. Thank you for your lovely service and professional advice/hand holding me through it. Couldn't have done it without you and we couldn't have asked for a more perfect ceremony and day. Thank you so much for Saturday - your poise and professionalism made me feel completely at ease once I stood up at the front with Simon. I was more nervous then I thought in the hours before the ceremony but the butterflies disappeared when I was able to listen to the words your spoke and how you delivered them. I have heard nothing but compliments from family and friends who wondered how I found such a nice officiant to be a part of our day. Keith, we would like to thank you for the lovely ceremony, your kindness and great humour. Our wedding day was very special and it is etched in our hearts forever. Dear Keith and Lynne, thank you very much for the role you played in our special day. We really appreciated your calm, kind, professional and engaging manner. We loved the ceremony you wrote for us and really enjoyed actually getting to say the words out loud and perform the actions. It was everything we thought it would be! We had such a great experience! Thank you so much for getting our new life together started. It was a perfect day we will never forget. We all really thought you were professional & a wonderful person all together. Thank you very much for your kindness and sincere hospitality. The wedding ceremony was very meaningful to both of us. We are happy that we have chosen the right people to conduct the ceremony for us and in a way that we would like to have as well. Thank you again for the lovely ceremony!!! Thank you very much for all your help. It was really an excellent wedding. Thank you so much for performing our elopement ceremony. It was nice, simple and informal which is just what we wanted. I will be happy to refer you both to any of our friends who are planning on getting married. We wanted to extend a huge THANK YOU for officiating at our wedding. It was perfect. As you know, we wanted things to be light-hearted and casual and you did that beautifully while still maintaining the sacredness of the event. It was as if you read our minds. Every one of our guests commented on how perfectly the ceremony suited us and on the way you placed all of us for the ceremony. Having the wedding party facing you as well as the guests was completely new to us - and what a great way to do it. Rather than just seeing our backs, everyone was included and felt a part of the service. Keith, thank you for making our wedding day very special and perfect in every way. Many of my family and friends complimented the ceremony and mentioned that we could not have gotten a better officiant. They truly loved it! We can't thank you enough for performing our wedding ceremony. It was absolutely perfect and as our witnesses would have told you totally us. An elopement/small informal ceremony is of great appeal to couples who want the utmost of simplicity, the lowest possible cost, and the flexibility to accommodate up to 20 guests without the usual fuss. Our rates are the lowest anywhere in Ottawa - starting at $150 and for years have been $38 to $168 (20 - 40%) less than the cost of a City Hall wedding ceremony ($188 to $418), much easier to arrange, and you get a superior ceremony in a better venue! We have lots of availability throughout 2019. Inquire about your date now! 4. to deal with a time critical situation that requires planning your event quickly… a pregnancy, deployment, financial challenges, child custody issues, job relocation issues, family illness, etc. 8. to move from "living together" to being legally married but you're not interested in making a big "to do" about it. 10. to start Immigration procedures. Here's one interesting, yet frank, perspective on why to go do an elopement. We're Here to Help You Keep it Simple! Here is the concise description about the different elopement and small informal wedding ceremony packages that we offer as well as the times for which they are available. 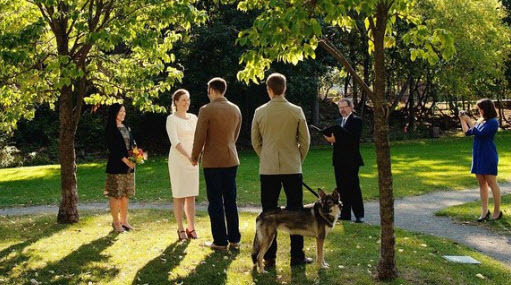 Please note all the additional flexibilities that make our wedding ceremonies a much better deal and alternative to an Ottawa City Hall wedding ceremony. 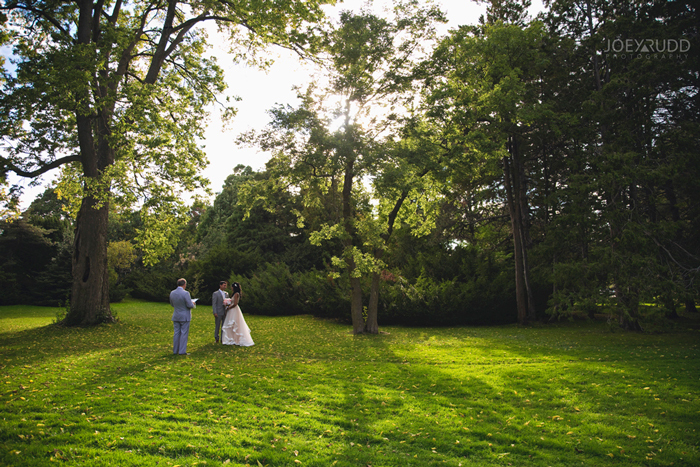 For several years, our rates have been $38 to $168 less than the cost of an Ottawa City Hall wedding ceremony ($188 to $418) and much easier to arrange! Moreover, the Ottawa City Hall wedding office is frequently, fully booked for wedding ceremonies on many days thereby disrupting any plans you may have to go there. As well, you are required to make a separate trip to City Hall in person and must pay in advance when booking a ceremony there. Our process is much simpler and friendlier, so please contact us asap to make alternate and superior arrangements for your wedding ceremony. Our schedules can fill up quickly, so please contact us at Keith@ExceptionalCeremonies.com or 613 - 831 - 7555 with your needs and we will respond immediately. 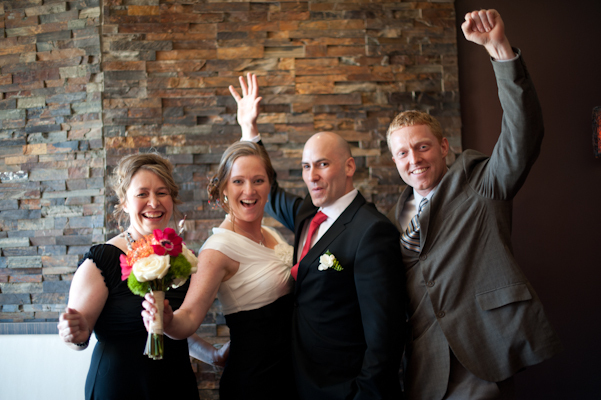 And if you have a "last minute" civil style wedding request, we will always try our best to accommodate you. Our fastest response time yet was performing a ceremony held only 45 minutes after we were contacted! Our Simple Elegant Elopement Ceremony Package: from $150 - Weekdays till 4:30 PM & $200 evenings till 9:00 PM; $250 Weekends -Friday 2:00 PM - 9:00 PM). These rates are for ceremonies held at our Stittsville residence on Mondays, Tuesdays, Thursdays, and Fridays.. Ceremonies can be held anywhere else in Ottawa for only $50 (weekends Friday to Saturday) -$100 (weekdays Monday to Friday) extra. Advance bookings available any day from 9:00 AM to 8:00 PM (except Saturdays 2:00 PM to 6:00 PM during the May-October peak wedding season. If your ceremony is occuring within three months from now, do ask as we may have some openings available even in the Saturday 2:00 PM to 6:00 PM peak demand period. Lowest rate anywhere in the Ottawa area- less than City Hall. No need to make a separate trip just to make an appointment - City Hall requires you to go and pay in advance of the ceremony date. Instant Same-Day Marriage Relief for Quebec Residents caught up in Quebec Provincial Bureaucratic Delays - It can take up to six to nine months to obtain all the necessary appointments and approvals before having a simple Quebec civil wedding. The $100 photography option is available mainly for ceremonies held at our residence. It includes at least 40-60 photos taken before, during, and after your ceremony using semi-professional Canon equipment. You receive all of your images immediately following the ceremony on a USB key and have all rights for unlimited use. Starting rates listed here are for weekday ceremonies (Monday-Friday till 2:00 PM) in the Ottawa area and have been discounted by $100 from the usual weekend rates (Friday 2:00 PM to Saturday). Peak demand dates e.g. Valentine's Day, statutory public holidays, Mondays of long weekends, New Year's Eve, etc. are at the weekend rate. These rates do not include the cost of the Ontario marriage license for which only you can apply. These rates do not include the cost of the Ontario marriage license for which only you can apply. Bookings for elopements and small weddings for 2018 are now well underway and in most cases may be made months in advance. There are a wide range of dates available throughout the year. 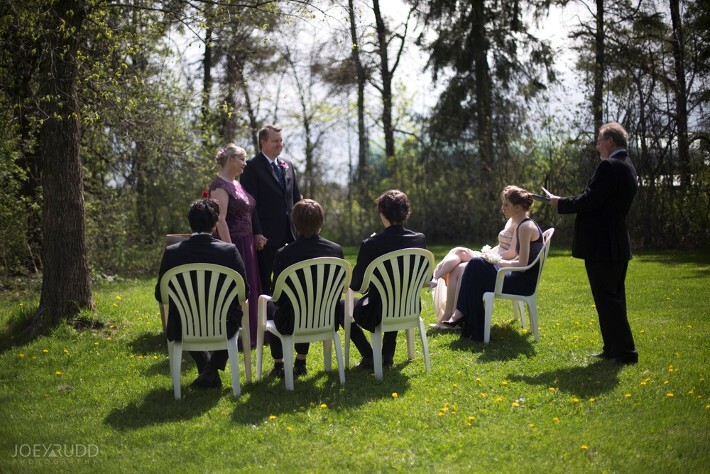 We can recommend some excellent outdoor venues for those who need suggestions. For those who prefer more detailed infomation and context on these different ceremony packages, the following should answer most, if not all, of your questions. Elopements and small ceremonies can provide you with all the beauty and joy of getting married without all of the usual mental and financial stress associated with a wedding. At one time, an elopement used to be a marriage conducted in a rather sudden and secretive fashion, often involving a hurried flight away from one's place of residence together with one's beloved with the intention of getting married. Now it has become appropriate for career oriented couples who want to forgo the major planning and decision making of a traditional wedding, or possibly have othermore immediate financial goals, like purchasing a home. Joey Rudd, is an experienced professional photogrpher who has won numerous awards for his creative approach to wedding photography. He is one of the very few local photographers that actually specializes in elopement wedding photography. Joey is offering a very attractive elopement professional photo package, starting at only $350. You can find many excellent samples of photos from ceremonies which we have performed together over the past few years at this page on Joey's website. We can provide suggestions for several other professional photographers who also accept bookings for small elopement wedding ceremonies and offer lower week day rates to capture you before, during, and after the ceremony at a wide range of photographic locations. The couple pictured below chose to hire professional photographer, Anne-Marie Bouchard, to accompany them as they revisited all the major places where their relationship had developed, culminating in an elopement ceremony held in the restaurant where they had first met. Anne-Marie captured their wedding day very creatively and has shared with everyone a great series of photos on her blog site. With an elopement ceremony, you can have elegance and all of the wonderful aspects of a traditional wedding day without all the fuss and stress that comes along with it. With just a tiny bit of planning, you can have it all! Like a rose beginning to bloom, with true love, an elopement ceremony with a small number of family and friends in attendance becomes a celebration of your new life together for all to witness and support. More and more couples are choosing to elope. When all is said and done, what is it that you want to remember the most? "Just the two of you" is the right answer for an elopement! 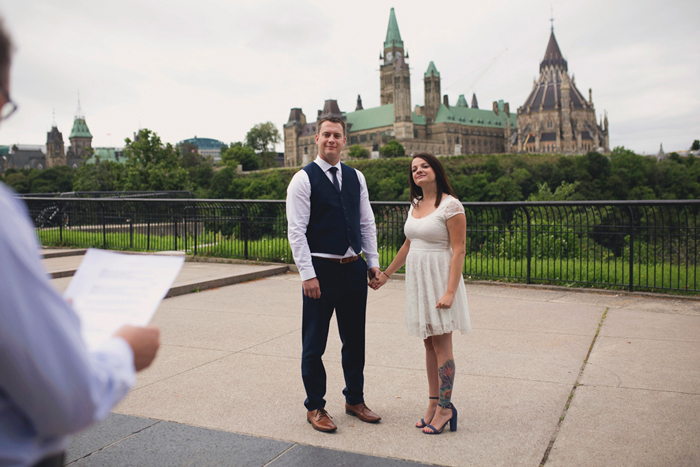 Doing an elopement amidst the physical beauty of Ottawa is much more romantic than a cheesy ceremony in Niagara Falls or Las Vegas and all of their unrestrained crass commercialism. Moreover, there is no waiting period or blood tests required for anyone. As long as you obtain a valid Ontario marriage license, you can get married even the same day in most cases. Come have an elopement here in Ottawa during Winterlude, Valentine's Day, the May Tulip Festival, Spring Solstice, Canada Day Festivities, Hope VolleyBall Tournament, Dragonboat Festival, Fireworks Festival, Summer Equinox, Hot Air Ballooon Festival, Fall colours, Winter Solstice, Christmas Lights, and other special times. Do you want much better deal than at Ottawa City Hall or elsewhere! We offer the lowest cost elopement weddings and best ceremonies in the Ottawa region with a range of options from $150 to $400 designed to a range of needs and budgets: where and when you want, with whomever you you want present, with a script that you can choose, control, and edit. As the leading independent elopement specialists in the Ottawa area, We are your best bet for every elopement budget and need. Moreover, we are are always available during weekdays when most other officiants are still at their day jobs and unavailable to you. No witnesses? No problem! We can help you arrange that too! Many couples from the Montreal area and other regions of Quebec are now making a memorable day trip to Ottawa to bypass the long times and bureaucratic requirements to get the necessary appointments and interviews in Quebec. They end up having a wonderful elopement ceremony, as quickly as within 10 minutes of obtaining their marriage license from the City Hall office in Kanata. Compare that to the many months usually required to have a civil ceremony performed anywhere in Quebec. Other couples from the Brockville and Kingston areas who have no access to a low cost, affordable elopement ceremony in their communities find the quick trip to us in Stittsville the perfect answer to their needs. When couples want to eliminate the pressures of a conventional wedding, they sometimes choose to “Elope” or have a small ceremony, without breaking the bank. 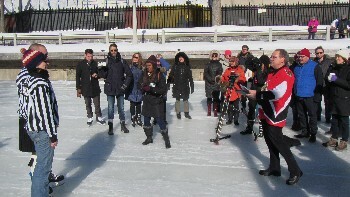 Whether it's during the Christmas-New Year's period, Valentine's Day, Winterlude, Solstice or any other time of the year, We will guide you in creating a unique and memorable ceremony at a wide range of venues. Elopement is fun and romantic!… Like a small private wedding… with or without a wedding gown, with or without a bridal bouquet… A ceremony restricted to the Bride and Groom (and a couple of witnesses) or may include few close friends and even the parents, followed by a nice dinner after the ceremony and maybe even (or not) a brief honeymoon. No witnesses? Well, we have a number of solutions for that issue. Elopement is a practical solution to career couples. It takes little preparation! Even though its a more simple ceremony, if you wish, there's still lots of opportunity to have its serious dimensions balanced with appropriate lightness and humour. Elopement may also be the only option to get married. When a couple in love, determined to share their lives together, faces opposition by one or more of the parents to the marriage due to religious, racial or cultural misconceptions. Such opposition is still not uncommon! 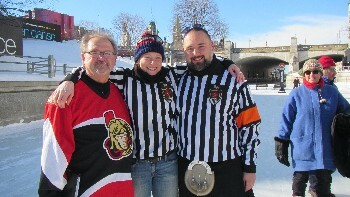 This ceremony was for two hockey referees from the UK who wanted to get married on the Rideau Canal during Winterlude. What started as a four person ceremony caught wind as it became a media story and about 30 guests and cameras crews joined in the festivities. Elopement is cheap. We will help you experience a tasteful and meaningful ceremony that satisfies all of your needs without the pressures and expenses of traditional weddings. Alternatively, we also have the creative means for you to successfully conduct an exotic foreign wedding ceremony with or without your own witnesses but with all the security and legal protections of an Ontario registered marriage. And this can be done quickly from just $150, which is a fraction of the rates charged by cruise lines and resorts for their cookie cutter impersonal ceremonies. Some couples have reported that they saved as much as $5,000 by doing their marriage legalities here in Ontario before their destination wedding ceremony in the Dominican Republic! November and December are increasingly becoming very popular months for elopement weddings especially near the Winter Solstice, Christmas, and New Year's Eve. If you're thinking about getting married around this time, it's best to check with us (Lynne and Keith) as early as you can so that we will be able to ensure our availability for your ceremony. Call us at 613-831-7555 to discuss your plans. 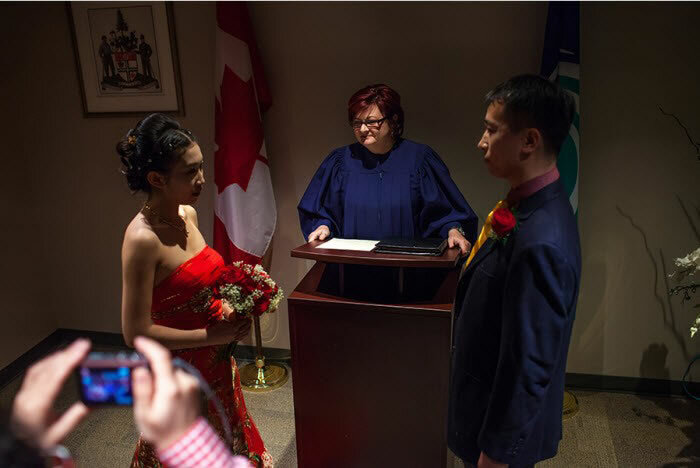 Once you have a valid Ontario marriage license, we can usually perform your ceremony the same day. With the Ottawa City Hall only doing a few ceremonies each day and often fully booked, we are usually the first available and convenient option for those who want their ceremony performed right away. No need to wait until the late afternoon, evening or the following day. And our elopement ceremonies are much more memorable and heart-felt than those sterile ones done by a municipal clerk at City Hall in a bland government office. Moreover, you can have your ceremony where you prefer and always in a much more picturesque setting than City Hall. We are located less than 10 minutes from the Kanata branch of City Hall (free parking) where marriage license are usually issued in 10-15 minutes vs. the 45-90 minutes it takes at the main downtown City Hall office (paid parking only). We have two different Elopement and Small Wedding Ceremony Offerings from $150 to $400 designed to fit different circumstances, visions, needs, and budgets. 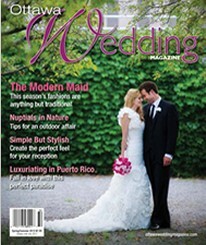 The Elopement Ceremonies are designed for couples who want an affordable yet high-quality wedding ceremony. 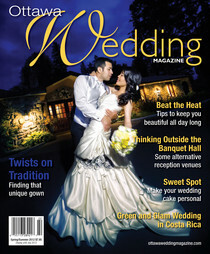 Therefore, the base pricing for these ceremony levels does not include any pre-wedding in-person meetings with us. We respect your busy schedule and your need to keep wedding planning time to a minimum so all pre-wedding arrangements are done via email and phone. For those in the west end of the city, we located less than 10 minutes distance from the City of Ottawa's Kanata marriage license office and are less than 25 minutes driving time from the Ottawa City Hall downtown office. Imagine, you can get your marriage license and then get married in less time that it would take to drive downtown, park, make your way through a confusing office complex, wait in a 45-90 minute queue, and only get a marriage license, let alone wait for an available opening for the City's bland and more expensive wedding ceremony which is only available at their downtown City Hall office. Our simple yet elegant elopement consists of a contemporary eight to ten minute, Justice of the Peace civil style ceremony (or at your option, the basic minimalist ceremony required by the Province), preparation, completion, and filing of all the legal documentation. It's ideal for those couples who simply want the peace of mind of a legal Ontario registered marriage prior to a destination wedding ceremony and for those who want to avoid the extra costs of translating and certifying foreign marriage documents. This simple elegant elopement package is available throughout the day and evening Monday (except long weekends) to Friday (except Wednesdays at our home) and before 2:00 p.m. on Saturdays. This simple elegant elopement can be booked in advance or often within an hour's notice, once you have a valid Ontario marriage license. This simple elegant elopement is $150 weekdays (Monday, Tuesday & Thursday); $200 evenings or $250 - Fridays 2:00 to 9:00 PM) for marriages performed at our Stittsville residence (the lowest rate anywhere in Ottawa). This is even less than Ottawa City Hall options and it's also available during the many times when City Hall (Mon-Fri, 9-4) isn't even open. No paid parking required either! This simple elegant elopement is also available elsewhere at your venue of choice in Ottawa for an additional $100 on weekdays or $50 on weekends. Please note that for ceremonies held at our home, we are not equipped to accomodate more than four guests, including the two witnesses. We can recommend many other suitable venues for ceremonies with more than four guests. 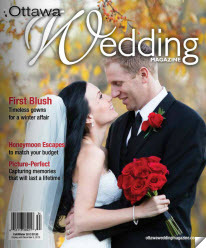 Our deluxe elopement/small wedding ceremony package is the best value wedding ceremony deal available in Ottawa. This includes a choice from amongst 10 different pre-written modern and contemporary scripts for ceremonies about 10-20 minutes in length and you fully control the content and you can revise and personalize the ceremony, as you see fit. This option includes e-mail consultation, access to our knowledge and experience base, officiation of your ceremony, and preparation and filing of all the legal documentation. This deluxe elopement is available throughout the day and evening Monday (except on long weekends) to to Friday and before 2:00 p.m. on Saturdays. 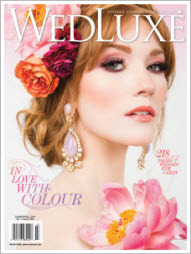 The deluxe ceremony can be booked in advance or once you have a valid Ontario marriage license. The Deluxe ceremony is $400 Friday to Saturday or $350 Monday to Thursday) Compare this to the the Ottawa City Hall approach for ceremonies held there on Saturdays from 1:00 to 3:00 PM only, using the same bland one size fits all, seven minute ceremony held in their sterile Government office (maximum of 7 guests at City Hall including your photograher!). Deluxe ceremonies can be held at most Ottawa venues of your choice including those with exceptionally photogenic panoramas (something that is also unavailable from City Hall or elsewhere), such as: the Arboretum, Nepean Point, Major's Hill Park, Victoria Island, and Bate Island, etc. This option is particularly attractive for those who wish to have up to 20 guests attend and experience their ceremony. Amongst the many elopement ceremonies that we have performed, they have helped some couples advance immigration processing by virtue of a Canadian-registered marriage even though they still planned religious or civil weddings later in their home country, some while transiting through Ottawa, some couples being posted abroad, some older couples who felt it was time and that their children would accept their decision to do so quietly, and some who simply appreciated the discretion and privacy that elopement affords them. We will be unavailable for ceremonies during the period of March 3rd to April 11th, 2019. During this time you may contact us via the Contacting Us form or by direct email (Keith@ExceptionalCeremonies.com) and we will reply as circumstances permit. Whatever your reasons for selecting an elopement wedding, we can help you turn it into a truly wonderful experience that others will envy. Contact us (Lynne & Keith) using the automated form or by phone at (613) 831-7555. Lynne and Keith Langille are not just any Ottawa Marriage or Wedding Officiant, non-denominational Minister, Chaplain, Celebrant, Justice of the Peace, or Marriage Commissioner. 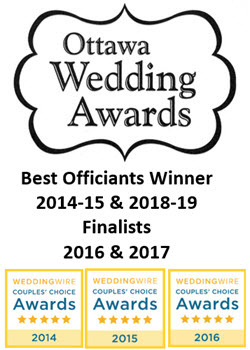 We are the two most innovative and experienced Wedding Officiants in the Ottawa area and our passion in helping you achieve a spectacularly unique and personalized ceremony is what drives us. 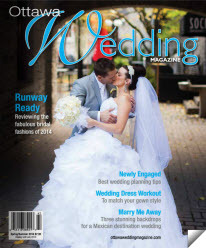 Call us at 613 831-7555 to see what we can do for you in helping you for your Ottawa area wedding ceremony. 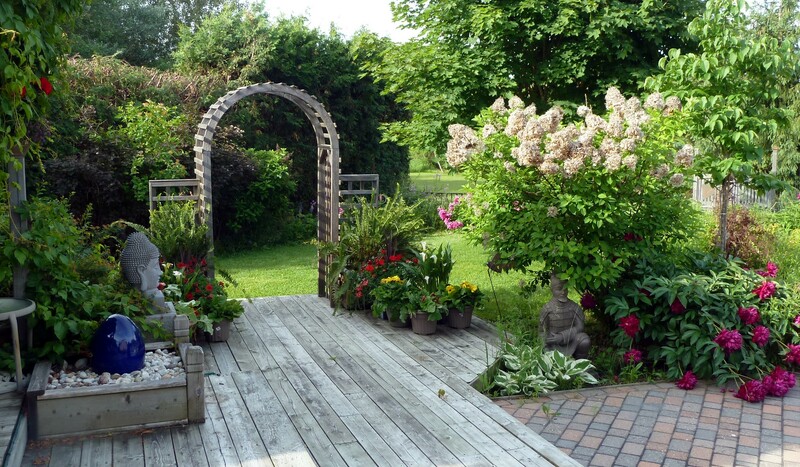 This website and all of its contents are copyrighted, 2008-16 by Lynne and Keith Langille, Ottawa Wedding Officiants. All rights are reserved by Lynne and Keith Langille and may not be used in any form without specific permission from Lynne and Keith Langille.